Please see my discovery drafts. So speaking of Tolkein, how do you think Legends of Tomorrow is going? My favorite show this year. Talk about good revisions, it’s night and day from last year. And now Snart is back. It’s the old Snart, not the new improved Snart, but I think Mick has a plan. Maybe. I will admit that the Supergirl/Flash musical crossover almost bumped them. The dads singing (Barrowman, Garber, and Martin? too beautiful), Barry tap dancing, that whole big musical bit for “Put a Little Love in Your Heart,” and then the ballad at the end? I smiled all the way through and then cried at the end. Just wonderful. Of course, most of those people have musical theater background so they should be good, but it was still marvelous to hear. I don’t know much about the guy on the piano–Winn from SG?–but boy can he sing. I’ll be watching that one again and again. I loved the music. “Super Friends” was adorable and that last song actually sold me on Barry and Iris, go figure! I’m so happy to have Snart back, evil or no. Anyway, if you get to writeups again, I’d be pleased. I’ll probably do one at the end, just because there’s so much to say about how they revised that show. I’ve learned a lot from this year. I will have to find this! I love Victor Garber. For years one of my favorite things to rewatch was a VHS tape of “Charlie’s Aunt” with Victor Garber and Charles Grodin. My dad had recorded it off the TV and it was sad when the tape finally died. Another place has a DVD of it for $4, but I have no idea how good that is. See, now you’ve made me want to watch the musical, and I told myself I was waiting until the season was on Netflix. I fell off Flash a couple months ago because I just can’t make myself enjoy the Flashpoint story. Every time they even say that word I have this surge of annoyance. So the plan is to just wait until it’s all over and power through the episodes I haven’t seen in a weekend to get it over with. But I might make an exception for the musical. The backlash against the Flashpoint stuff and how dreary the show has been this season might be enough to get them to reboot Flash the way they rebooted Legends. Legends is so good this year. The Flash cast is so good that they’re being squandered on all that dark angsty story. The musical was just so HAPPY. Plus Barry and Supergirl together are like watching puppies eat ice cream. “Cute” should not be that charming and fun but they’re incredible together. The only episode of Supergirl I’ve seen is the one with Barry in the first season, and I watched it just to see him. They were great together in that and the alien cross over. It’s decided – I’ll watch the musical. They do a sappy tap number together called “I’m Your Superfriend,” written by Rachel Bloom. And the people from LaLaLand wrote the final ballad. I like the LOTR movies better than the book, though I’m always impressed by the world building. The extended versions and all the extras on those DVDs have helped me crochet several large blankets. I’ve never seen the movies. Read all the books in the 70s, so I might be time to go back. I did manage to pick up most of the references in the Tolkien episode of Legends of Tomorrow, so that’s something. I have the Marple short stories in hardcover. Never letting that one go. KJ Charles blog on contracts in publishing. Will get the link in a bit. Needed to paste and post this first. Get an expert lawyer to read your contract and explain it to you. Always get a good agent or lawyer to read the contracts. And those clauses are getting clobbered in court. Big thing to watch in the wording of the reversion clause, too. I was going to mention this blog post, too. It made me realize how much I’ve forgotten since I had to type up contracts in the eighties. I recently listened to the audio version of The Hobbit (it’s probably been 40+ years since I read it), and while the narrator’s performance was excellent, I was really disappointed by the story itself. It just seemed sort of flat compared to my memory of it, and some sections went on and on and on and on (like the famous riddle scene that could have been wrapped up with just three or four riddles instead of what felt like twenty), while others felt rushed (although I can’t think of an example at the moment). http://kjcharleswriter.com/the-authors-biggest-mistake/ For ALL writers who need to read and sign contracts. Is it Mercury retrograde? Not that I care for astrology much, but something is impeding my usage of electronica. Am I the only one who thinks that Tolkein was the ultimate “My darlings must LIVE!” author? He put in everything and then had appendices too. Well, he was writing in a different time period in a genre–saga–that does tend to go on and on. But he did something magic or it wouldn’t have had such an impact. I think part of it might have been the time . . . I remember loving it in high school and college. I don’t dislike the darlings. Am example is Tom Bombadil who never made much of an impression on me. In my mind he is the very image of the idea of the “Hail, fellow. Well met!” type and I see why it needed to be left out of the LOTR film. There are many other books that were pared down (cough, Circle of Magic, cough) and feel as if something is missing while Tolkein feels like EVERYTHING is there. In contrast, I like Tamora Pierce’s shorter books more. They’re leaner and meaner for it, the world-building happening around the corner unseen makes the prose more immersive, and I quite enjoy the focus on character and single narrative as more directly linked. I liked the first two Emelan quartets much more than Will of the Empress or Battle Magic, where she dove into the other stuff. Preferred the slimmer Immortals books to the bricks the Tricksters and Beka Cooper bricks, too. I loved Immortals and it felt as if the length was just right. Didn’t mind the length of the Will of the Empress or the Trickster’s books. Found Beka Cooper a bit annoying because of the first person narrative. I just always felt as if The Circle of Magic books had been cut back ruthlessly. They always felt as if they could have been a little bit longer. This was borne out later by Pierce saying something about needing to write shorter books for children until Rowling just wrote whatever length Harry Potter she needed to tell the story. I’m so bloody exhausted y’all. Hope that made sense. When I reread CoM a few years ago, I was surprised by both how slim they were, and the density of the text. Sandry’s Book covered a much longer timeline than I remembered, and contained much more world-building than I remembered. I think I just enjoy that ruthless pure functionality more, especially in light of how most hyped TV has moved away from strong episodic structure, to its detriment. Daja and Briar’s books are intense for their focus. Plenty of supposed thrillers written for adults could learn from their pacing. Spent today wandering in the hills, and managed to find the stone circle and row I was aiming for. Nearly missed it – I was about to head downhill when I realized it was less than twenty feet away. The stones are only 1-2 ft tall, so rather hidden by vegetation, even though the bracken hasn’t started growing yet. There was a wonderful bust of Tolkein halfway up the stairs in the English faculty library. And he saved my sanity: I stayed on for a few days after the end of my first term at Oxford, for some extra reading time. I’d spent the whole term expecting a tap on the shoulder, and a tutor saying, ‘Well, Miss Birdsell, you’ll have realized we made a mistake offering you a place . . . ‘ Anyway, I was wading through endless literary criticism, when I came across Tolkein’s essay, ‘Beowulf: The Monsters and the Critics’ – which put all the nit-pickers and wild theorists in their place, hilariously. I realized no genius was required, and started to relax and enjoy my course. I just finished watching the Debbie and Carrie memorial online. It was great. I really hope someone puts it online because my computer keeled over twice during the streaming, dammit. Gavin de Becker, of all people, gave a whoppingly good and funny talk about knowing her since high school. Oh, god, I can’t. I’ll dissolve. I’d love to watch it, but I already have a seriously ill cat–I’d be a blubbering mess three minutes in. Of course, the contract stuff will do that to me too. The LOTR movies were actually pretty good. I’m surprised you haven’t seen them. Tolkien and I don’t get along, reading wise. I think it’s a saga thing and an “earnestness” thing. It’s a very earnest story (even with the little flashes of humor) and I’ve never been able to read it (or listen to an audiobook) without falling asleep. Yes, I’ve tried many times at different ages/life stages. I just need a little more bite and more female characters when I’m spending that much time in a world. But I love the movies (no Tom B. helps) and I find Gandalf and the Fellowship have many words of wisdom about staring true evil in the face that help in our trying times. ? Oh and I have a similar relationship with Star Trek. Admire the hell out of it, but it doesn’t grab me because it has that earnest “teaching me a moral” feel. Please don’t take away my nerd card, I promise I love everything else! Your nerd card is safe. There are many kinds of nerds here on Argh. I read Tolkien when I was about nineteen. I think that probably helps. Star Trek never did it for me the way Star Wars did. I think you kind of fall into one or the other, although I love Galaxy Quest. My fantasy worlds were the Wrinkle in Time books (soon to be a major motion picture) and the Norton Witch World books and Pratchett forever. The first two are much more female centered and Pratchett is Pratchett. Serious books that do not take themselves too seriously most of the time. When I was in grade 5 the last 2 periods on Friday were dedicated to reading, one block reading on our own or out loud in groups and the very last class of the day was our teacher reading to us. Wonderful idea. She read us A Wrinkle in Time and A View From the Cherry Tree by Willo Davis Roberts and another book that never stuck in my memory the way those two did. I still sit down with AWIT at least once a year, preferably on a wild, rainy day, and devour it. I’m fairly certain that my non-conformist streak was validated and amplified by that book. I still think IT is one of the creepiest villains ever. Those boys bouncing the ball in perfect synchronization send chills down my spine. AWIT and The Hangman in grade 12 made the biggest impression on me out of all the literature I ran into in school. Did you know they made a graphic novel version of A Wrinkle in Time? I loved that book, Meg and Charles Wallace. My intro to fantasy was Merecedes Lackey’s early Valdemar books. I might not read them now (all those italics), but I still value them for introducing me to fantasy, and forming the basis of my attitudes around LGBTQ from a young age – different than what I might otherwise have got at home and my all girls Catholic school. The books we read when we are young are important. Oh Thank God. I’m not the only one who can’t handle LOTR. I’ve read it twice, once in my teens and again in my twenties. Nope. Doesn’t do a thing for me. Not even interesting in watching the movies. and I love fantasy, SF and saga, for the most part. I read a lot of Terry Brooks’ stuff and still have the paperbacks because I just can’t let them go. I love it that you love Brooks’ work. I spent a couple summer work/vacations with him and I can tell you he is the sweetest man on earth, an absolute darling. I love it when good people get praise. My favorite Tolkien stories when I was little was The Smith of Wootten Major and Farmer Giles of Ham. I haven’t read them in ages though so I don’t know how they hold up. I used them for a high school book report since we could use anything by Tolkien and they are short. My teacher had not heard of them and made me bring the book in to prove they were really by Tolkien. The first fantasy novels I remember reading were the Dragons of Pern series and the Zelazny’s Amber books. He is one of the few authors I have ever met. He was very kind and a fabulous reader. I read McCaffrey and Zelazny, too, and loved them both. I had trouble going back to McCaffrey–she has some terrible ideas in some of her stuff–but I haven’t tried going back to Zelazny. Terry Brooks is an amazing writer. I keep thinking I need to go back and reread the Shannara series but then I get scared at the time commitment to read it all, start to finish. Landover is easier to reread. I started rereading McCaffrey’s Talented series recently. It is not aging well. Dragonsinger and Dragonsong fare better, probably because they deal with such a compressed timeframe and sort of cloistered group. I think I read a book or two of Zelazny’s in my teens. Probably should try again. It makes me sad, because I read everything she wrote and loved her dearly, but I’m having the same problem with McCaffrey. Oh, I forgot them! I certainly would have liked to have my own little dragons. I met my husband through the Fellowship of Middle Earth club we were both involved in at uni. I still have both my hobbit cloak and elven cloak in the cupboard. Needless to say, Tolkien has played a big part in my life. When I was in fifth grade, my home room reacher read to us the last period of the day on Fridays. She introduced us to The Hobbit and I went home and told my father about it. He went out and bought everything he could find by Tolkein (including a British cookbook so he could make Bilbo’s poppy seed cake). I have been a Tolkein fan ever since then. My oldest sister could not get into the books but several years ago she went on an extended road trip and listened to the Recorded Books Inc. version (read by Rob Inglis, I believe) and fell in love with them during the trip. Her comment was (and I paraphrase as I don’t remember the exact wording) that these were written as if the intention was to tell them at the fireplace on a winter night like the Norse Sagas and other stories were done, so listening to them worked for her when reading them did not. It made sense when she put it like that. My favorite nonfiction book might just be “The Wand in the Word: Conversations with Writers of Fantasy,” and one of the interesting threads through the interviews was to track each author’s relationship to 1) WWII and 2) Tolkien. You run the gamut of people who served during the war and/or was in one of Tolkien’s classes to people who were born long after, and wrote in response to the conventions he popularized. They also all talk about their writing process and their priorities in writing, so great insight in all directions, not just for fantasy. 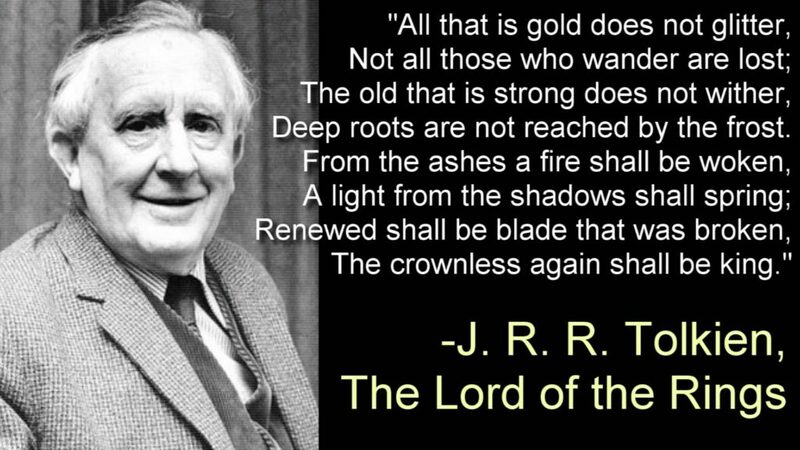 Very much a Tolkien appreciator though I have only read LOTR all the way through one time. Have not seen the films because, well, I liked the books … and frankly I think I could re-read the books in less time than it would take to watch all the films. The Bodleian has republished ‘Smith and Wooton Major’ and ‘Farmer Giles of Ham’ with the illustrations by Pauline Baynes, if anyone wants a copy (http://www.bodleianshop.co.uk/books/how-to-books/farmer-giles-of-ham.html ; http://www.bodleianshop.co.uk/books/how-to-books/smith-of-wooton-manor-j-r-r-tolkien.html ). I have never been able to like ‘The Hobbit’ much, but I saw ‘The Fellowship of the Ring’ and was then had to read the books. I thought the extended versions of the movies captured them beautifully, superbly acted and written with a perfect score. I admired the writing in ‘The Silmarillion’, but I don’t think I could slog through it again. Something is weird in the land of Argh. Ok, something is weird-er. I’m on the laptop, instead of my regular mobile browsing. Thanks to all the Arghers for fantasy recs. I will be bookmarking this page. The comments only nest so far. If AG’s comment was in reply to a reply, just reply to the same comment she replied to and it should nest beneath hers. You may remember some of the posts that went over 300 comments? The nesting on those suckers was insane. William Goldman’s brutal takedown of saga-authors’ darlings in The Princess Bride is still classic. I laugh just thinking about the paragraph excising Morgenstern’s soliloquy on trees. “Deep roots are not reached by the frost” – clearly the best line! I lived off Tolkien for years, for quotes just like that. Firstly, I’m setting off on a PhD focusing on Realism in Harlequin Mills & Boon novels, and I was wondering how you balanced your research with your fandom when you were doing your research. And secondly, I’m also an editor for the Pink Heart Society (www.pinkheartsociety.com), and I was wondering if you’d be interested in writing something about writing older heroines for our #ViveLaDifference column in May. It’d be a multi-person piece, with about 600-800 words per person. Sure, this is the right place. I’m not sure what you mean by the first question. I never saw a disconnect between my fans and my research for my novels so there was never any balancing act. And when I was researching my PhD, I didn’t have any fans; that was before I started writing romance. Second Question: Right now I’m am writing only Nita and the blog posts here. After that, I have to do a Character Unit for the Writing Romance blog. Then I’ll have to rewrite Nita again. So I won’t be doing any other kind of writing for the foreseeable future. I know it’s only 600-800 words, but you have no idea how long that would take me. I have blog posts on here I’ve revised twenty times before I posted them. I wish you the best, though! And thank you for the fangirl flail, always appreciating. I suppose what I meant by your fandom, was the fact that you enjoyed the books that you were studying- were you able to keep academic detachment, or did it colour your writing? There was actually a separation between academe and romance writing. I was doing the research while I teaching high school and after I’d had a year sabbatical to do the PhD coursework. The research made me read romance novels, and reading them made me realize I wanted to write them. So I started writing after my coursework and abandoned my diss to concentrate on fiction. When I went back four years later to finish the diss and get the degree, the head of the creative writing department said, “You should be in our program,” and I switched over and worked on my fiction while getting my MFA. Still haven’t finished the diss.